"...When you add a variety of acting styles (many of which are too broad for the characters to be believable) and the lack of any rising tension overall, the production just does not do this play justice. One feels throughout like the focus was on the wrong things. The lesson here for Halcyon is to refocus on the core ideas of the work in hand, and on the forging of a credible comedic world occupied by vulnerable characters. It would have been better off here throwing all the stuff away and just letting Hwang's characters talk in imagined circumstances; we would surely have better believed in them." "... It should make for lousy theater, but Hwang's imagination is so keen that he turns stasis into a fascinating, hilarious sociological study. In act two, though, he manufactures an absurd, metaphor-heavy family meltdown, and sharp observation gives way to overdetermined mayhem. Jenn Adams's breathless Halcyon Theatre production can't solve the script's problems, especially with an uneven cast, and Tony Adams's bare-bones set turns an upscale home into the aesthetic equivalent of a double-wide." "...All this would be inexorably depressing if taken seriously, but Halcyon Theatre director Jenn Adams has prudently chosen to pace her production at a speed emphasizing the humor of newly affluent SoCal dwellers struggling with fashionable cuisinarts, microwaves and automatic grillers. The cast is uniformly excellent, fearlessly immersing themselves in personalities nowadays largely relegated to ethnic stereotype. Special mention, however, is due the courageous Mia Park, whose intractable Ama is a saber-toothed Tiger Mom dispensing policy as draconian as that of the totalitarian states she now purports to deplore." 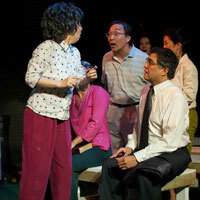 "...“Family Devotions” is a risky, challenging show that shows the bravery of Halcyon Theater. At times, the pace and staging feels disjointed, or too chaotic, but nevertheless, there are enough gems to warrant a viewing." "...Though some moments land with precision, overall Hwang’s delicate balance of biting satire and goofy farce eludes Halcyon’s production. Jenn Adams’s staging has too little room to breathe in the cramped confines of the Greenhouse’s downstairs studio space; Tony Adams’s scenic design creates blocking and sightline issues even as it does little to suggest a nouveau-riche Bel Air sunroom. With the cast tilting overblown from the start, Hwang’s heightened climax loses its power." "...But then it’s hard to blame Halcyon. The play isn’t subtle. It isn’t specific either. Dirty laundry and skeletons in the closet are pretty much the same wherever they crop up. Add to that the fact that “Family Devotions” is dated by its insistence on the purity of identity and you’ve got a play that’s a lot less useful or entertaining than Hwang’s other two Chicago offerings." "...Under the direction of Jenn Adams, the action takes place in three locales: one inside the house and two outside. In such a small theatre space, Scenic Designer Tony Adams cleverly uses a net to separate the outdoor areas. It helps give some perspective on comings and goings. But I still got confused. (I only figured out post-show that FOB means fresh-off-the-boat.) Overall, it’s a lot people, in a little space, for a short amount of time. It took me awhile to understand who is who? Even with the program as a guide, I still am not quite certain." "...There are some missing elements to what otherwise is a story of family and heritage and how people who leave their country either live in the shadow or make the adjustements to their new lives. Hwang has matured as a writer and perhaps one day, he will go back and look at this script as a baby that needs to be retrained. A little nip here and a tuck there and a larger stage to work with might be it all it needs." "...If you’re a fan of Hwang’s work, you will enjoy Halcyon’s production because of the script. Likewise, if you’re of Chinese descent, you may identify with some of the cultural references. But a general theatergoing audience with expectations for a polished play may leave disappointed."